The Dairy01282 845284work Self-cateringThese beautifully converted single-storey flint barn conversions, have pine decor and country antiques. On the fringe of the village, with good walks all around, the sea is under 10 minutes drive away, with quiet bird reserves, fishing villages like Blakeney 6 miles and livelier resorts too - Cromer is 12 miles along the coast. Hunt Cottage with a secluded walled garden with patio and vine clad arbour. The Dairy with beamed and vaulted bedroom with 17th-century timbers and retaining lots of character. 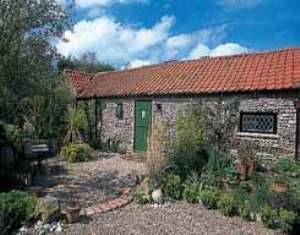 Both cottages offer a charming hideaway for discerning couples and older family parties. The cottage suits partially disabled guests. Shop and pub 1 miles. All on ground floor. Cottage lounge, breakfast kitchen, vaulted & beamed double bedroom with en suite toilet & basin, bathroom with toilet, basin & separate shower. Services: OFCH. All fuel, power, bed linen (duvets) & towels inc. Parking for 2 cars. Video. M/wave. Separate enclosed small garden with patio & chairs. One small well-behaved pet, under strict control (bring own dog bed). Non smokers only (from May 2008). These beautifully converted single-storey flint barn conversions, have pine decor and country antiques. On the fringe of the village, with good walks all around, the sea is under 10 minutes drive away, with quiet bird reserves, fishing villages like Blakeney 6 miles and livelier resorts too - Cromer is 12 miles along the coast. Hunt Cottage with a secluded walled garden with patio and vine clad arbour. The Dairy with beamed and vaulted bedroom with 17th-century timbers and retaining lots of character. Both cottages offer a charming hideaway for discerning couples and older family parties. The cottage suits partially disabled guests. Shop and pub 1 miles. All on ground floor. Cottage lounge, breakfast kitchen, vaulted & beamed double bedroom with en suite toilet & basin, bathroom with toilet, basin & separate shower. Services: OFCH. All fuel, power, bed linen (duvets) & towels inc. Parking for 2 cars. Video. M/wave. Separate enclosed small garden with patio & chairs. One small well-behaved pet, under strict control (bring own dog bed). Non smokers only (from May 2008).